This February and March (and a little bit of April), we’re taking a look at the 1995 to 1996 season of Star Trek, including Star Trek: Deep Space Nine and Star Trek: Voyager. Check back daily for the latest review. What is perhaps most surprising about Broken Link is how quiet and subdued it all it. The fourth season began with a bang, with the dissolution of the alliance between the Klingons and the Federation that had been established in Heart of Glory and dramatised in Star Trek VI: The Undiscovered Country. In fact, The Way of the Warrior featured the largest and most impressive combat sequence in the history of the Star Trek franchise to that point. Even allowing for The Sacrifice of Angels and What You Leave Behind, the fourth season premiere still ranks as one of the most elaborate set pieces in the franchise’s history. Broken Link consciously circles back to that. It features the first reappearance of Robert O’Reilly as Gowron since The Way of the Warrior. The episode makes it clear that the problems depicted in The Way of the Warrior are only worsening. There is no small suggestion that Gowron is hoping to turn the cold war between the Federation and the Klingon Empire into a shooting war. Broken Link is very much a show about taking the status quo that was established in The Way of the Warrior and ramping it up. However, what is most striking about Broken Link is the manner in which it escalates the situation. Not a single weapon is discharged in Broken Link, which is the last season finalé of Star Trek: Deep Space Nine not to feature a combat sequence of some description. The actual plot of the episode is remarkably straightforward and linear, keenly focused on a single member of the ensemble rather while relegating politics into the background. 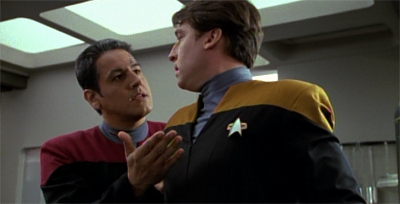 Even in terms of the scripting of the episode, care is taken to slow the pace down and allow character-driven dialogue scenes. The result is a strangely intimate season finalé, one free of the bombast that comes with the season-bridging two-parters favoured by Star Trek: The Next Generation and Star Trek: Voyager. It is interesting to compare Broken Link to something like Basics, Part I, if only because the latter would never make room for Jadzia joking about being surrounded by “naked men” or Garak playing “Star Trek Cluedo” with Odo in sickbay. In fact, Broken Link is even relatively quiet by the standards of Deep Space Nine, lacking the galactic status quo shift of The Jem’Hadar or A Call to Arms. As with a lot of the fourth season, there is a sense that the production team have made a point to learn from the third season: to improve upon what works and to fix what doesn’t. The Adversary was something of a happy accident at the end of the third season, a script thrown together at short notice when Paramount vetoed a season-ending cliffhanger that would be loosely adapted for Homefront and Paradise Lost. The slow character-centric tension of The Adversary was never intended to close the third season, but Broken Link realises that such an approach worked well. The result is an episode that feels incredibly comfortable in its own skin. Deep Space Nine is well aware of what it is, regardless of the direction and input that the studio offered the production team at the start of the fourth season. In fact, despite its somewhat relaxed pace and the space that it affords its character interactions, Broken Link is remarkably focused on what it wants to do. The closing line of the episode (and the season) is clever, consciously tying back the bold new direction of The Way of the Warrior back into the series’ own larger endgame. In hindsight, Broken Link is something of a misleading title. Instead, it ties everything together. This September and October, we’re taking a look at the jam-packed 1994 to 1995 season of Star Trek, including Star Trek: Deep Space Nine and Star Trek: Voyager. Check back daily for the latest review. 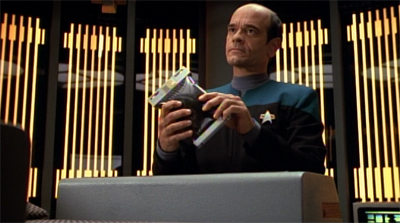 So, Learning Curve is the last episode broadcast as part of Star Trek: Voyager‘s first season. It’s hard to get too excited about – or be too disappointed by – that. Is the show finally starting to gel? Learning Curve‘s position in the broadcast order was apparently a bit of blind luck. It was actually the fifth-last episode produced of the show’s first season. It just found itself broadcast in the “season finalé” slot when UPN decided to hold back the remaining four episodes of the season until the Fall, to broadcast leading into the second season. However, despite this, Learning Curve seems as good a choice as any to close out the first season – and certainly a better choice than Brannon Braga and Jeri Taylor’s preferred candidate, The 37’s. It returns to the conflict between Starfleet and the Maquis promised in Caretaker, but only fleetingly acknowledged in episodes like Parallax or State of Flux. Although the execution leaves a lot to be desired, it does create a sense that the show has come something of a full circle. So, I saw the final episode of V last night. Talk about disappointing. The series throws us a giant big cliffhanger and then… boom! It’s cancelled by the network in what has been referred to as a “bloodbath.” What makes it more frustrating, though, is the fact that the cancellation was quite probable even as early as last year, so it wasn’t as though the series was cut down in its prime without any warning. The cast and crew knewthat there was a fairly significant chance that this episode would be the last to see the light of day… and they ended on a whopping big cliffhanger anyway. I can’t help but feel a little bit disappointed.